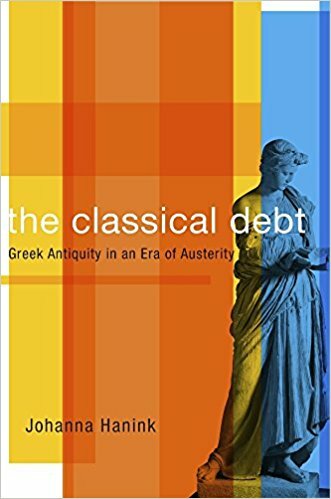 In his review of Johanna Hanink’s The Classical Debt: Greek Antiquity in an Era of Austerity (TLS, 2/9/18), John Psaropoulos refers to the “British thalasocracy”--this latter being a word you might not be familiar with, referring to states who gain their power through control of the seas. The point relates to questions of Greek debt. Who owes who what? From an economic point of view the Greeks are in debt to the EU, but might it not be the other way around? What about the incalculable debt that the West has to Greek civilization? 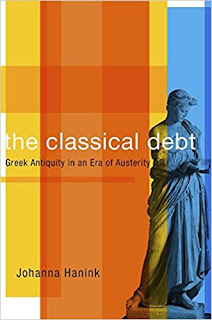 Says Psaropoulos, “The premiss of The Classical Debt—whether a cultural debt can be held against a financial one—turns out to be an organizing principle around which to have a broader discussion: how classical scholars and early travellers to Greece idealized ancient Athens and created a philo-hellenic movement.” Naturally the West early showed its thankfulness for the legacy of ancient Greece by plundering ancient monuments. The controversy over the Elgin Marbles is one of the most recent examples of the fallout from this misplaced enthusiasm for the classical world. As Psaropoulos points out in his essay no Greek politicians are seriously considering using such arguments as a way of evening the score. However when one thinks of culture and economics one is prone to cite the vagaries of the international art market. Reframing the question of debt, as the volume under consideration does, truly addresses the issue of who owes what and how two different currencies are or are not fungible.